Let's face it, those of us in the plastics molding industry typically have to deal with sink marks with most parts. We all understand that the Geometry, Variations in Wall stock and Interior features sometimes go beyond design guidelines and result in sink marks. For reducing sink marks there are some process adjustments that may resolve the problem. If you have Quality Tooling and an accurate water temperature controller, you might be able to "Freeze Off" the Cavity side of the part while keeping a good hold pressure on the resin. This technique would usually add time to the total cycle but perhaps worth it. I have also used the RHRC (Rapid Heat Rapid Cool) process which is not used at many molders since it requires a Steam System that is piped to the Molding Presses-----and the Tooling must also be featured for this process. This process has produced some of the Highest Quality parts I've ever seen and has the ability to reduce sink marks as well as knit lines-----all due to having greater Process Control during the Molding Cycle. When you change your molding process in a way that forces the resin to "Freeze Off" on the outer surfaces (Cavity Side), or come to a finished state without allowing a natural or symmetrical cooling, you will introduce higher Stress Levels. You should find out the reason of sink mark. It can be: 1) too low of injection pressure or holding pressure. 2) The holding pressure or cooling time is too short. 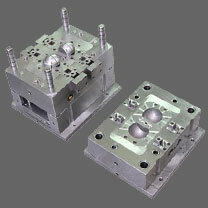 3) The temperature of the melt or the mould is too high. 4) Improper designing of the plastics part and also of course there could be more other reasons, but these can be more or less the reasons.